When you clean your home, do you have trouble reaching spots you used to reach with ease? Are chronic pains all over your body preventing you from tidying up your home like you used to? When we get older, keeping our homes clean can prove to be harder. With that, let 3GS Direct Care Services Provider Home Care help you out! We will keep your home clean and organized so you can relax and focus on your health. We also provide you with companionship during the day. As your family members go to work or school, we’ll keep you company and have conversations with you. 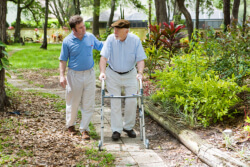 Companionship prevents isolation which is a common dilemma for seniors these days.